Manfred Mantis with Electric Guitar, Lg. 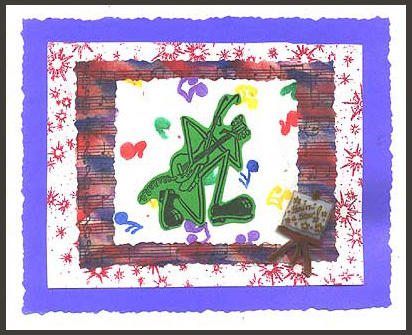 “Manfred with Electric Guitar, Lg.” was stamped in black Memories on green card stock, cut out and glued to “Musical Notes” which was stamped on off white card stock by inking with markers and trimming with deckle scissors. This was glued to “Musical Notes Background #2” which was stamped in black on off-white card stock and embellished with the “direct to paper technique” using purple and red pads, then trimmed with deckle scissors. These pieces were glued to “Starburst Background” which was embossed in red on off white card stock and layered on purple card stock. “Easel” and “You’re a Star!” were stamped on shrink plastic, colored with oil color pencils, shrunk, glued to each other and mounted on the right corner of the card. Card by Davetta Alexander. Tags: Davetta Alexander, Decorative Scissors, easel, Embossed, Manfred with Electric Guitar Lg., Markers, Musical Notes, Musical Notes Background #2, Oil Color Pencils, Shrink Plastic, Starburst Background, You're a Star! 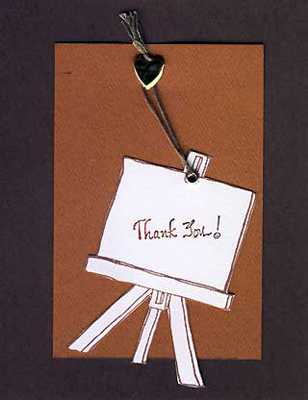 “Easel” and “Thank You!” are stamped on white card stock in brown and the easel is cut out. A rust colored rectangle has been mounted on brown card stock. The easel has been suspended from a heart shaped brad which was placed near the top of the rust rectangle by a tan string and connected to a silver eyelet which has been inserted at the top of the easel. Card by Tammy Dunlap. Tags: Brad, Cord, easel, Eyelets, Tammy Dunlap, Thank You! 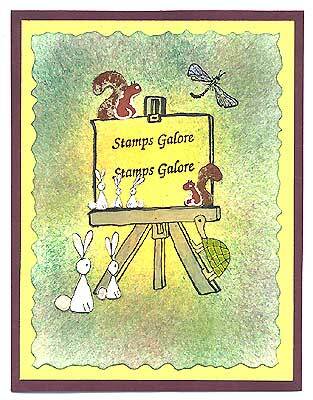 “Easel”, “Dragonfly, Sm.”, “Three Bunnies, Lg.”, “Three Bunnies, Sm.”, “Two Squirrels, Lg.”, and “One Turtle” were stamped in black Memories on yellow card stock that had been sponged with green and pink leaving the center clear where the easel was stamped. All the animals except the dragonfly were stamped again, cut out and mounted with foam dots. Images were colored with pencils and crystal lacquer was applied to the turtle’s shell. Glitter was applied to the dragonfly’s wings. Puff balls were added to the rabbit’s tails. The card was trimmed with decorative scissors and layered over yellow, brown and white card stock. Card by Thalia Sledge. Tags: Colored pencils, Decorative Scissors, dragonfly, Dragonfly Sm., easel, Glitter, One Turtle, rabbits, squirrel, Thalia Sledge, Three Bunnies Lg., Three Bunnies Sm., turtle, Two Squirrels Lg.